Restless waters of Ichhamati is the story of rural Bengal during Company rule based around Mollahati Indigo plantation. The book explores various broad aspects of life in this region, including British rule, Casteism, Zamindari system, rural life, mental makeup of rural India, religious beliefs along with some finer emotions as well like the enigma around relationships, relationships between husband and wife, father and daughter etc. All in all, the book is a masterpiece if you really want to peel off the layers and reach the true rural India as even after centuries the basic beliefs and culture hasn’t evolved much in rural India (as well as in the minds of many people in urban India). As an added bonus, the book also explored the scenic beauty of Bengal around the river Ichhamati. 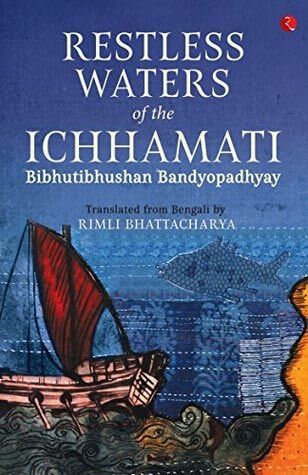 Restless waters of Icchamati was the last book of author Bibhutibhushan Bandyopadhyay. He was also awarded the Rabindra Puruskar posthumously in 1951 for this book. Through the eyes of Dewan Rajaram we discover the culture and practices in the Neelkuthi as well as in the villages around the area. It is Rajaram who handles majority of the work in the Neelkuthi, including procuring lands for indigo cultivation. He is respected among the folks as well as feared by most for his ruthlessness when it comes to getting his job done. Bhabhani is another respected man in the community married to three sisters of Dewan Rajaram. As the story unfolds we become witness to the kind of man he is, his ideals and modern thinking, his affection towards Tilu, eldest of his wives, and later towards his son. The narratives of Babhani were particularly very good where we get to learn so many good things through this character and his relations with people around him. Ramakanai Kobiraj is another very admirable character who teaches us how to forgive and how to stay true to your principles. His way of life is the purest, a true Brahmin he is as well as an excellent healer. Well, Nalu Pal is the entrepreneur that you should look out for. How he builds a big business out of nothing, making him richest man around those parts, starting as a small vendor. The book takes a critical approach towards cast, religion and related malpractices. Through the narratives of Chandimandap the author shows how this group of Brahmins with large shares of land idle away their life smoking hukkah, playing board games and making critical judgement over the lives of everyone in their vicinity. It’s sad to see how such people enjoy the highest status in the society while those who’re really contributing to the society neither have the value nor the money. As the storyline progresses we see the uprising among the masses leading up to the indigo revolt. We also see in the story how oppressed women in those times were and even those belonging to the highest order of brahmins couldn’t find it any easier. It was simply hell for those belonging to lower castes, particularly when someone was supposed to be tainted as Gaya. That reminds me the narratives of Gaya and Prasanna were intriguing in their own way, eventually building up to the most touching moments at the later part of the book. Also, the conversation between Bhabani and his son turned out to be excellent emotion-evoking narratives. What can I say? There is emotion, there is action, there is drama, there is love, there is sadness, there is repulsion. All that you could have asked for, everything in one book. It’s a complete package. One of the best books I’ve read recently. Storyline being huge, covering so many people all at the same time, the plot may seem a bit slow but it’s quite gripping and enlightening. When I began with the introduction I wasn’t sure if this was something I could have read, but after turning a few pages I decided that I had to complete this book as soon as possible. The writing style is not too descriptive, yet enough to let us visualise everything that the author wants to convey. The author must have researched a lot in writing the book, as several conversations take references from various sacred Hindu texts including Vedas and Bhagwat Gita. One thing I loved about these conversations was that they looked at Hinduism (without actually mentioning Hinduism anywhere) from a spiritual perspective rather than a perspective involving blind faith and malpractices which is more prevalent even in our current times. Learning about the lives in those times and those days makes me both sad and happy at the same time. In the introduction part, it’s mentioned that the author didn’t intend to write a historical novel, and while reading the book we discover that he has actually blended facts with fiction really well. Though, I haven’t read the original book in Bengali, I am sure nothing was lost in translation. I can claim that the essence of the book was preserved since everything was so coherent and comprehending. The character development is excellent and there is no character in the story that I cannot connect with. It’s a tremendous job to simultaneously build so many characters in so much detail. Each one is written with great depth and their characteristics are represented beautifully in both physical and psychological forms. The resolution of the book, with tiny resolutions to each of the character’s narratives, is a mix of ecstasy and tragedy. I cannot think of a better way to end this book. Masterfully done. I would recommend this book to all Indians (and even Non-Indians). It’s a great opportunity to learn about the history of Bengal in that era along with Indian culture, both good and bad, such that we can imbibe the good into our lives and learn to improve from the bad. Also, those looking for good Indian literary books, this is a must-read. Overall, an excellent piece of work by Bibhutibhushan Bandyopadhyay as author and equally nice work by the translator Rimli Bhattacharya. Restless waters of Icchamati is a complete book with all elements including nice writing style, great plot, strong characters, emotions, actions and lessons to take home. Overall, an excellent piece of work by Bibhutibhushan Bandyopadhyay as author and equally nice work by the translator Rimli Bhattacharya. Restless waters of Icchamati is a complete book with all elements including nice writing style, great plot, strong characters, emotions, actions and lessons to take home.